Looking for a steal of a deal on slab countertops? 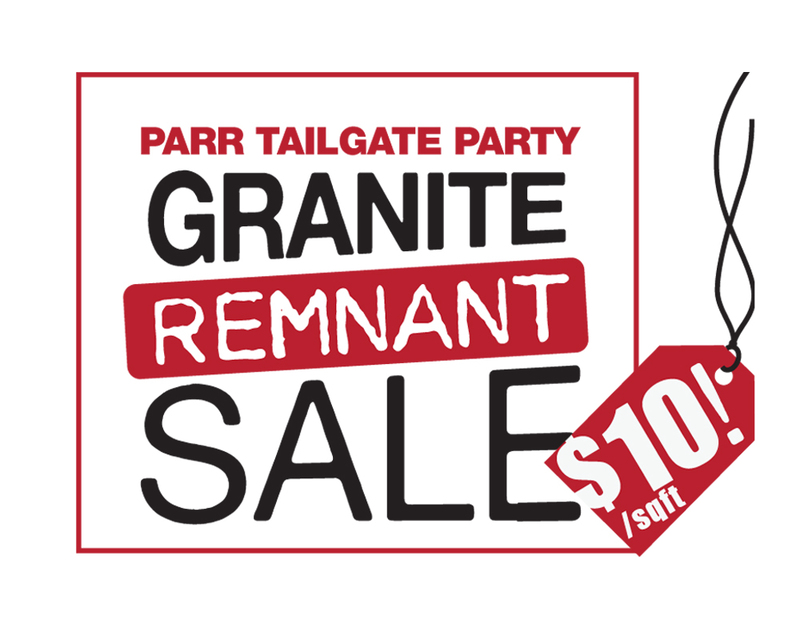 Parr Cabnet Outlet is hosting a clearance sale of slab granite, quartz, marble and other exotic stones. We have hundreds of pieces in every style and color you can imagine, and they’re all one low price of $10/sqft! So bring down the friends and family for three days of tremendous savings! What Should I Know Before I Go?WHAT DO I NEED TO BRING? The sale is three days only, so make sure to bring a drawing with measurements for your planned countertop. It will help us give you an accurate price and prevent delays! WHAT TYPE OF MATERIALS ARE YOUR REMNANTS? We have many natural stones such as granite, marble, travertine, limestone, soapstone & slate. We also have quartz surfaces such as Cambria, Zodiaq, Caesarstone, Silestone & more. Generally, the pieces are 3cm thick (1 ¼ in) but many are also 2cm (¾ in). We will not be selling any solid surfaces (i.e. Corian, Hi-Macs) at this event. HOW BIG ARE YOUR SLABS? CAN I DO MY WHOLE KITCHEN? We have pieces in all sizes from coffee table size to full slabs. Generally, they average about 12-30 sq ft.
WHAT ARE THE COSTS TO FABRICATE MY REMNANT INTO A FINISHED TOP? Prices start with the slab size @ $10/sqft. For fabrication, add just $24/sqft (based on top size, not remnant). The price of edges, cutouts, and radiuses are already in this price! HOW MUCH DOES THE TEMPLATE/INSTALL SERVICE COST? The template/install service is a $16/sq ft charge with a $200 minimum (based on the sq ft of the remnant, not finished top). This also assumes you live within 50 miles of our shop. See template/install trip charge for more. WHAT IS THE TURNAROUND TIME FOR A FABRICATED TOP? We plan on a 7-10 business day turnaround for fabricated tops. It could be shorter depending on the simplicity of design. We will notify you when your top is ready for pickup. The event is set up for cash & carry (you pick up) or full service (we do the template, fabrication & install) which includes delivery. CAN I PICK UP MY TOPS THE SAME DAY I BUY THEM? Unfinished pieces are same-day cash & carry. Fabricated pieces have a turnaround time (see above). IF MY TOP LAYOUT DOESN’T USE THE WHOLE PIECE, HOW DOES THAT AFFECT THE PRICE? CAN I KEEP THE LEFTOVERS? Prices are based on the remnant size @ $10/sqft regardless of the size of your layout. We will have layout specialists on site to help you determine if the piece you want will be of suitable size. Any falloff during fabrication will be sent to recycling; we do not supply unfinished leftovers for liability reasons. Finished leftovers (i.e. cutting boards or coffee tables) can be supplied at the fabrication price of $24/sqft. WHAT IF THE PIECE I PURCHASE ENDS UP NOT BEING BIG ENOUGH TO DO MY JOB? We’ll ask you to select another remnant and charge or credit you the difference. WHAT IF MY TOPS END UP NOT FITTING? If we fabricate countertops from your drawings, they will be based on your overall dimensions with basic geometry (rectangles, circles, etc). This is generally safe for tabletops, islands and simple vanities but we cannot be held responsible for the final fit if you forgo our optional template services. CAN I USE YOUR TEMPLATE SERVICES AND DO THE INSTALL MYSELF? No. If the tops are complex enough to need template services, they will need the installation expertise of a professional; therefore we do not offer template services without install services. I LIVE WAY OUT IN (insert far away land). WILL YOU STILL COME OUT TO TEMPLATE AND INSTALL? Certainly. But anything beyond 50 miles of our shop is charged a $100 trip fee. Sorry. All sales are final for this event. We will gladly accept cash, Visa or Mastercard. We’ve done our best to outline the standard charges of the event but if anything out of the ordinary is needed, be sure to tell one of our staff so they can help you with your request. OTHER SERVICES TO THINK ABOUT. Plumbing and tearout are additional services we offer. Prices for these services can be discussed with your sales rep.
~ by Fine Line Pacific on October 8, 2010.